My uncle, James Bruton, was born in Smithfield in Dublin in 1890. In 1910 he emigrated to the United States on the Campania out of Liverpool. In 1917 he was drafted into the American army and assigned to the 77th Division, a unit that is widely regarded as pivotal in bringing the war to a successful end for the allied side. The 77th Division has gone down in history as the "Lost Battalion". The 77th were involved in an action in the Argonne Forest in France between the 2nd and the 7th of October 1918 towards the end of the war. They were not supported as planned and became cut off from the rest of the allied forces and surrounded by the German army. A six-day siege ensued when the 77th Division came under heavy bombardment from all sides, including at times from their own troops. Only 140 survived from an initial complement of 500 men in the 77th Division. My uncle James Bruton was killed on the last day of the siege. He is buried at Plot E, Row 41, Grave 35, in the Meuse-Argonne American Cemetery in Romagne, France. I never met my uncle but I have his photograph and photographs also of his service medals, his grave and the medal envelope. Times were very difficult, and compensation was paid to my father and his sister for the death of James. This enabled my father to buy a house in Donnybroook, Dublin 4 (for £525) where our family lived for 75 years until the sickness and death of my sister who remained in the house. It would not have been possible for a postman to buy a house in those days otherwise. The sacrifice of my uncle’s life enabled our family to live comfortably. Photograph service medal for the Meuse-Argonne campaign. ; Photograph of James Bruton's grave. 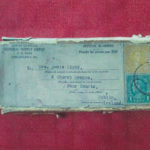 ; Photograph of medal envelope. 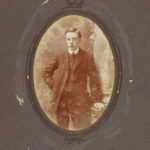 ; Photograph of James Bruton Photograph of William, his brother (and father of Lucy Bruton, contributor).